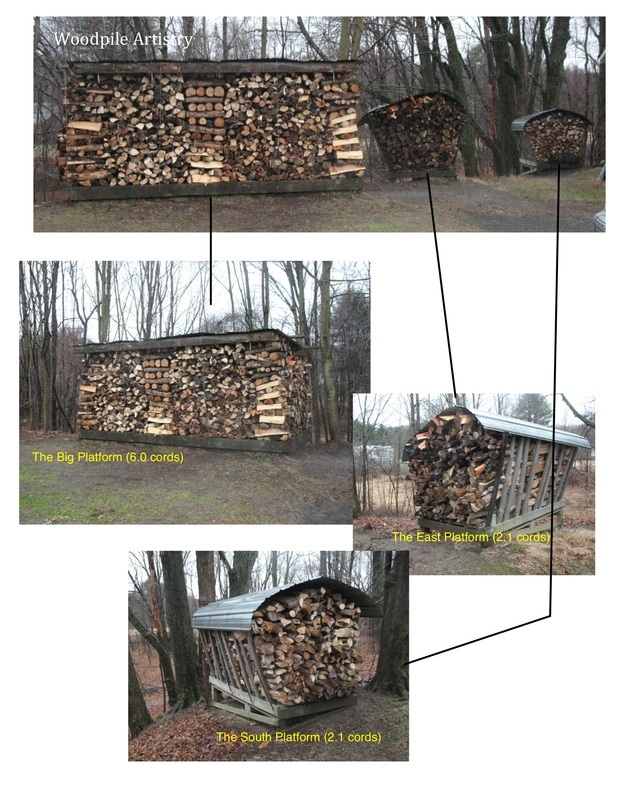 About 12.5 cords of split wood under cover and seven dump trailer loads of logs in the woodlot. We are in good shape for the next three years of sugarin'!! See photos below for details. Now we just need winter followed by warm days and cold nights. We have pretty consistently tapped within a few days of February 15 each year for the past 16 years. See ya in February 2014. 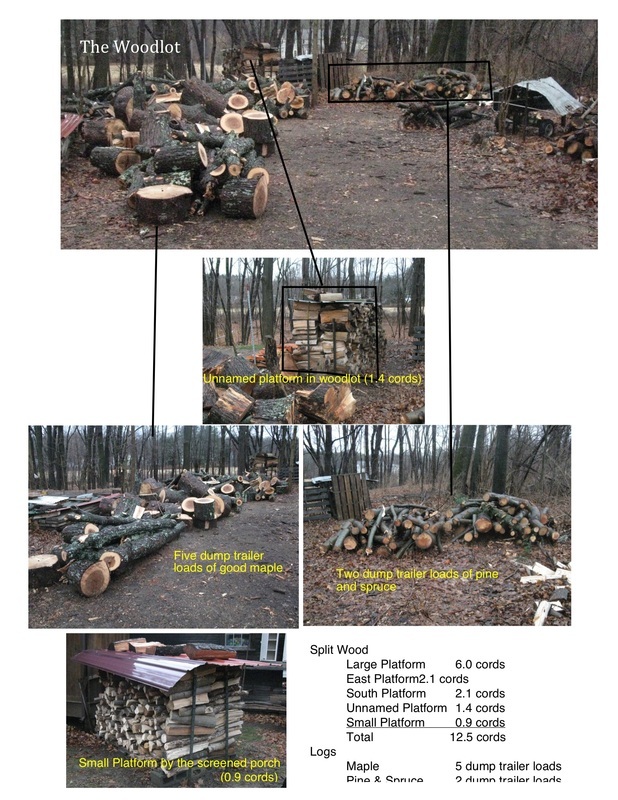 Last Saturday seven of us chain sawed, cord wood sawed, split, hauled and stacked a lot of wood. We also put the roof on the large platform. See attached photo. Looks nice, doesn't it! BUT, we didn't quite get it all done. There is a cavity in the pile on the large platform that still needs to be filled. 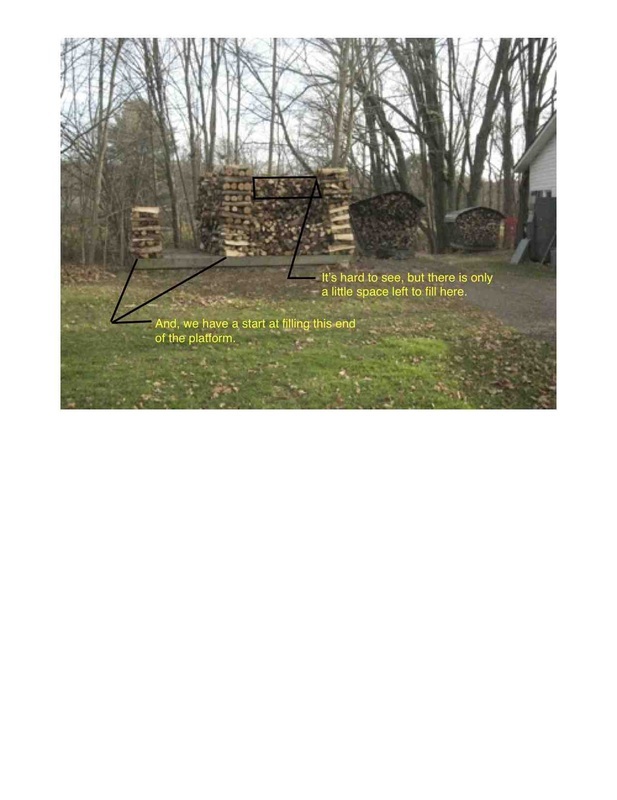 (It's not visible, but it is accessible from the left side of the pile as you look at it in the photo.) Also, the small platform by the screened porch still needs some wood added. Both of those add up to about a cord (128 cu. ft.) me thinks. As always, come for some or all of the day, and come even if you haven't let me know, but knowing who is coming makes me feel all warm and fuzzy. It actually is okay to come just for milk, tea and cookies but there will be considerable razzing. And, the winner was...... Steve Braun! "Many maple sticky hands make delicious light work"
See below for entire original message. For my reminder message that I will send out this Thursday, you provide me with a subject line. (Mine have been getting a git drab, me thinks). There will be a prize (but don't get your hopes up to much for how thrilling it will be). As always, come for some or all of the day, and come even if you haven't let me know, but knowing who is coming makes me feel all warm and fuzzy. It actually is okay to come just for lunch but there will be considerable razzing. Last Saturday eight of us cut, split and stacked a lot of wood. See photo attached at the very end of this message. As always, come for some or all of the day, and come even if you haven't let me know, but knowing who is coming makes me feel all warm and fuzzy. The main appeal of the sauna for me is that we can cool off by dipping in Puffer's Pond. The sauna is wood fired. It is located at a neighbor's house. The pond is about 100 feet from the Sauna. Quite private after dark, swim suits optional in and out of the sauna. There is no parking for us at the sauna. It's about a 5-minute walk from The Sugar House. It is good to have a water bottle to keep yourself hydrated. A review of sauna history and what it takes to make it happen...... Many years ago we concluded a work day now and then with a sauna and dipping in the pond. When we were boiling syrup in February we sometimes did the same by cutting a hole in the ice. That's the real adventure! Then, most of the sauna people moved away. I need to know that at least a few people definitely want to do it in order for me to be willing to set it up. On the high end, eight people is crowded but doable. Reserve your spot now! A previous message announced the next work day on Saturday, November 2. I'm sure we will need at least one more after that. Start after lunch and go until just before dark. Exact start and end time to be announced closer to the day. Optional sauna with dips in Puffer's Pond following the work. Again, exact time to be announce closer to the day but something like 4 or 5 p.m. until maybe 7 p.m. or so. Many years ago we concluded a work day now and then with a sauna and dipping in Puffer's Pond. Then, most of the sauna people moved away. I'm hoping we have some new enthusiasts. I personally don't care much for the sitting around in the sauna part, but I love the adventure of jumping into very cold water (or through a hole in the ice when we get well into winter). I need to know that at least a few people definitely want to do it in order for me to be willing to set it up. I'll be asking for a show of interest (and commitment from at least a few) closer to the time. I need to check with the owner of the sauna ahead of time to see if we can use it. 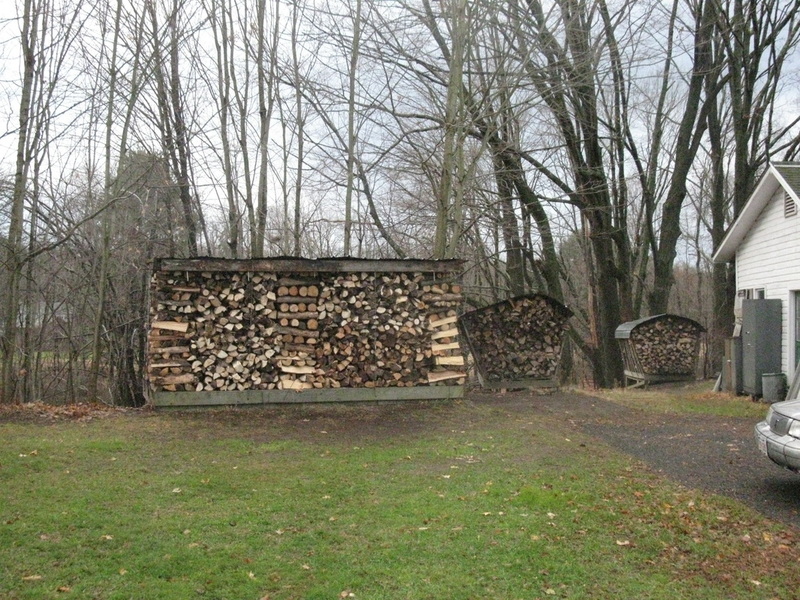 Then, I need to check to be sure there is enough firewood for the incredibly cute little wood stove that heats the sauna. On the day of the sauna, I need to go over and start the fire about 30 minutes before we walk over. The sauna is at a neighbor's home on Puffer's Pond about a five-minute walk from my house. Between warm sauna and very cold pond is about 100 feet. In the dark it is quite private. Doing this when there is snow on the ground is even better, but that will need to wait a bit. and I hope to see you next on Saturday, November 2. But first be inspired by what we have done. See attached document. Two weeks ago we got some of the above done, but we have lots more to do. We are replacing about five, maybe six, cords of wood that we burned last season. Many years ago we concluded a work day with a sauna and dipping in Puffer's Pond. Most of the sauna people have moved away. Any of you interested in doing that? If so, I'll check with the owner of the sauna to see if we can use it, and we will schedule a work day to end just before dark. Dipping in the pond is much preferred after dark because we don't have to cover up to do it. Do let me know if this appeals to you. I personally don't care much for the sitting around in the sauna part, but I love the adventure of jumping into very cold water (or through a hole in the ice when we get well into winter). Does anyone actually read to the end of these messages???? As always, come even if you haven't let me know, but knowing who is coming makes me feel all warm and fuzzy. The super season we had last year (remember we made 55 gallons of syrup!) 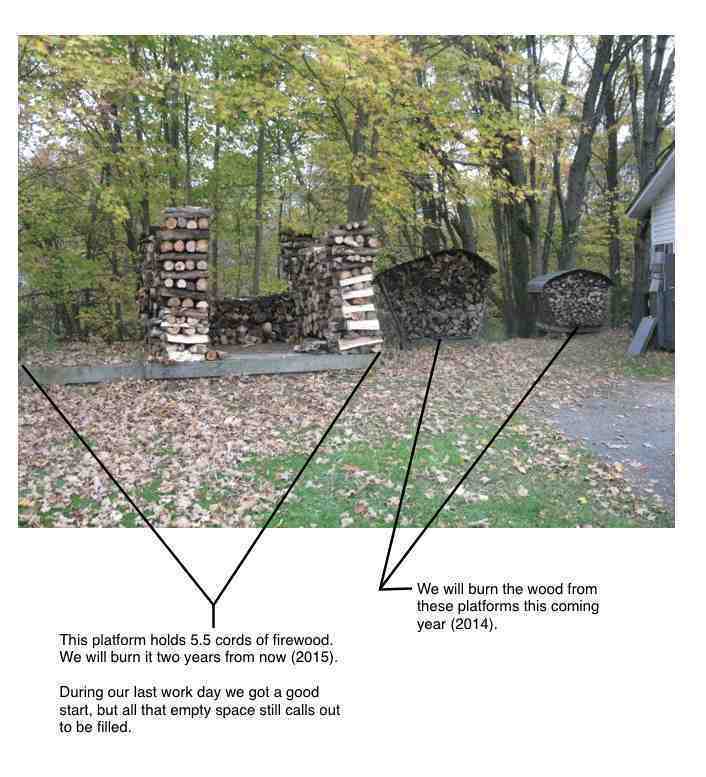 means we burned a lot of wood. Gotta replace it.